Receive notifications when loved ones leave or enters an agreed 'SafeZone'. What’s unique is that while you are in the safezone your location is masked giving you more privacy. Ask one of your loved ones to check-in on a schedule. You will be notified when they miss a check-in. Activate the Panic alarm in an emergency situation to alert your loved ones and let them see your location. View a compilation of news articles and blog posts that keep you up to speed with everything related to family safety. Be sure to contact us if you have an article that you think would be useful for others. POM is now free, we think that safety should be for everyone and not just those who can afford it so we have removed the subscriptions and made our app completely free for everyone. We have also made some bug fixes and have added address search functionality to the safezone feature to make it easier to setup your safezones. On top of that we have added a Newsfeed to POM, this will be a collection of interesting articles related to family safety, we hope you find them useful! Honestly would say that I love this app. The amount of times I go out and meet new people on dates, I always had friends and family begging me to message them to let them know I’m safe or where I am to ensure nothings gone wrong. This has saved me so much, plus I get to check out when my friends are going on dates too to ensure I know they are safe!! The notifications are perfect, the apps easy to use. Definitely recommending this! 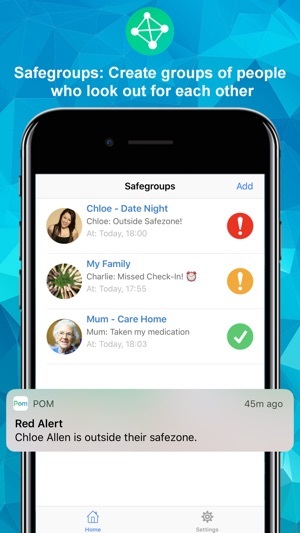 POM is such an innovative way to keep your family safe without seeming like an overbearing parent! That said, it gives me such peace of mind to know there is a panic button activation feature. Simple to use, definitely recommend. Just love this app, it keeps me as a parent from feeling so worried and keeps my kids happy I’m not getting on at them for there whereabouts which protects the trust I share with my kids. Brilliant idea!